Subscribe to Reader's Digest magazine for 12 months & save 50% off! Offer expires 16.05.2019. Available to AUS residents only. Offer applies to 12 month subscriptions only. An iconic magazine that has been entertaining readers for over sixty years, Reader’s Digest is still just as popular and well-read as ever. You’ll find every issue still packed with real-life drama from the ordinary to the extraordinary, engaging and inspirational short stories, newsy topical articles and relevant lifestyle info. Regulars like Laughter, the Best Medicine, Life’s Like That and All in a Day’s Work remind us of the funny side of life with jokes, anecdotes and funny stories that are guaranteed to make you smile and have a giggle; while Personal Glimpses, Picturesque Speech and Points to Ponder will keep you thinking, inspired and entertained from issue to issue. 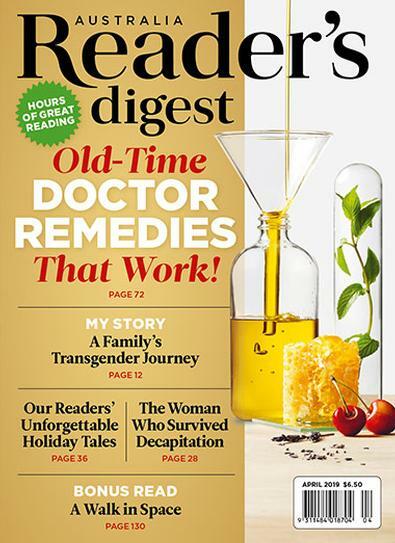 Reader's Digest Australia is a thought-provoking and entertaining monthly magazine that has been loved by many for over 60 years. Packed full of real-life stories, thrilling short fiction, humour, news and interesting lifestyle content. Each issue will have you entertained, inspired and informed. It's no wonder it's the world's best loved magazine. Still easily the best value for money magazine, handy purse size and a good price with lots of interesting articles to keep you interested for years, I have been reading it now for many eons and love it! Reader&apos;s Digest is a wonderful magazine, at such reasonable prices and real life stories that are always interesting to read each month. A mix of real-life heroes, humour, drama, trivia, hot topics and helpful advice! Its a very good book for international students to improve their knowledge and english.